CSUN Alumnus Justin Emord Takes His Passion for Music to Washington D.C. Comments Off on CSUN Alumnus Justin Emord Takes His Passion for Music to Washington D.C.
Bass guitarist Justin Emord's passion for music led him to advocating for music education on Capitol Hill. Photo by David Hawkins. National Association of Music Merchant members attend the NAMM SupportMusic Champion Award dinner in honor of Sen. Robert Casey (D-PA) at Nelson Mullins on May 22 in Washington, D.C. Photo by Kris Connor/Getty Images for NAMM. 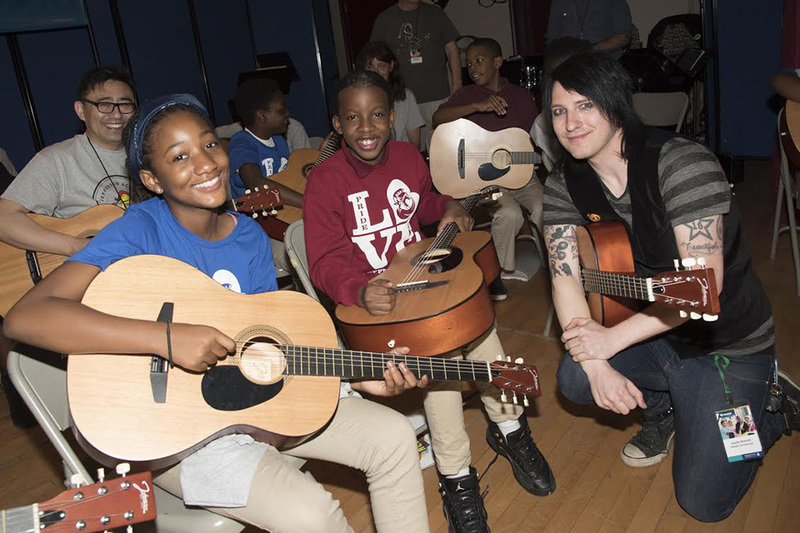 Emord performs with students during NAMM's Day Of Service in Washington D.C. Photo by Kris Connor/Getty Images for NAMM. NAMM President Joe Lamond, Emord and other NAMM members speak with Rep. Jim Panetta (D-CA) during "NAMM, VH1 And CMA Day Of Music Education Advocacy Capitol Hill" in the Cannon House Office Building. Photo by Kris Connor/Getty Images for NAMM. 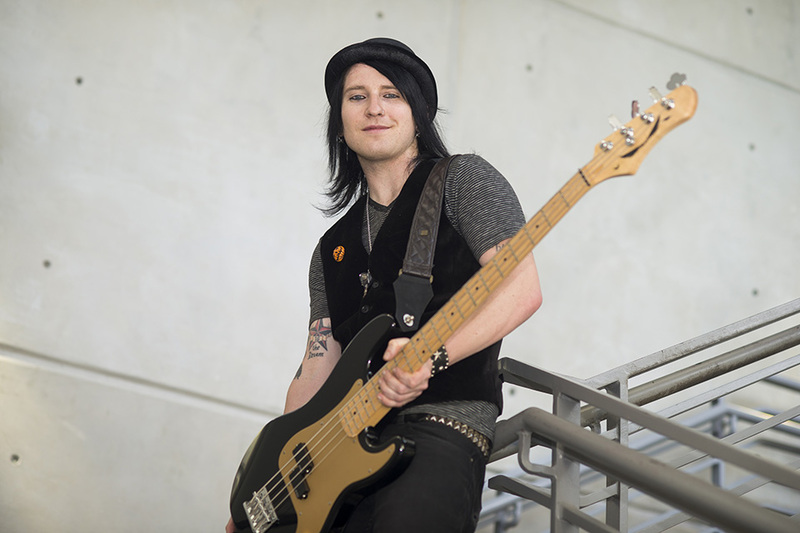 As the bass guitarist for Los Angeles rock band Love and a .38, Justin Emord ’12 (Communication Studies) is used to being in front of crowds of rock ‘n’ roll fanatics. 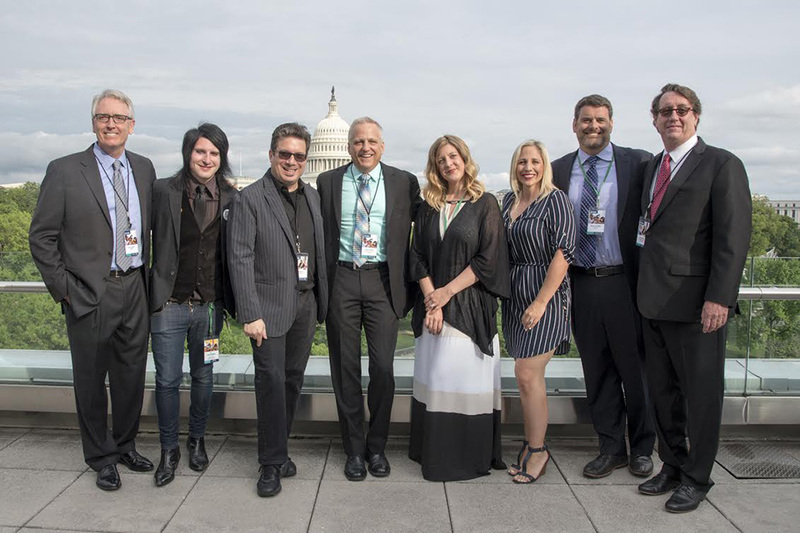 But in May, Emord’s audience shifted to politicians and senators as he advocated on Capitol Hill with the National Association of Music Merchants (NAMM) about the importance of having music education in K-12 schools. NAMM, a non-profit organization that hosts annual music trade shows in Anaheim and Nashville, Tenn., advocates throughout the year on the importance and benefit of music. Emord said he initially felt out of his comfort zone, but he adapted quickly. Emord credited California State University, Northridge for giving him the tools to spread a passionate message about why music programs are so vital in schools. Emord more than held his own during numerous meetings on Capitol Hill and credited part of that to the classes he had at CSUN, particularly with Communication Studies professor Peter Marston. According to Emord, his trip to Washington almost didn’t happen. Emord advocated for more funding for music programming in elementary and junior high schools. NAMM’s main purpose on Capitol Hill was to talk with members of Congress about the implementation and funding of the Every Student Succeeds Act, which was signed by President Obama in 2015. The act is intended to provide schools with $1.65 billion for music programs, but so far only about $4 million has been allocated to the proper programs, Emord said. To Emord, the trip to Capitol Hill was a success in making sure more of the allocated funds will soon be given to schools across the country. “A lot of people were very interested and receptive to our message, and in the grand scheme of things, $1.56 billion in the federal budget isn’t that much to ask for,” Emord said. Emord is a real-life example as to why having music education in schools can have a life-changing effect. His passion for music was initially sparked by his fourth-grade music teacher. The teaching Emord received in his youth is a main reason why — when he’s not traveling the West Coast with his band — he devotes his time to schools in Anaheim a couple times a year with NAMM’s Support Music Coalition, a program that helps children learn and grow with music. On the first day Emord was in D.C., he stopped by a local elementary school to show students how to play basic notes on the guitar. Emord’s passion for music, as a performer, teacher and advocator, comes as no surprise to the professor that knows him best. capitol hill, guitar, justin emord, love and a .38, Music, paul amico, Politics, Washington D.C.